This program consistently raises questions that television is usually too frightened to address, even the US Public Broadcasting System. Last night in the episode I watched, the news anchor, a character called Will McAvoy, asks why baseball players can be indicted for perjury if they lie to a Congressional Committee, but Presidential candidates aren’t indicted for perjury if they lie to the American people. Good question. The Republicans are trying to get more of the female vote despite their anti-abortion and even anti-birth control policies (shades of the 1950s). According to the Economist, they claim that 92 % of the job losses under Obama’s Presidency were women’s jobs. But the Economist says this isn’t so: there are only 29,000 fewer “women’s” jobs than when Obama took over. And even these losses were causes in large part by the Republicans’ cutting stimulus packages to local governments, causing job losses in education. In another segment the anchor asks a fictional spokesman for Mitt Romney how exactly Romney’s marriage has been adversely affected by gay marriage. This is a question I have often asked: how exactly does gay marriage adversely affect straight marriages? I live in a country that’s had gay marriage since 2006, and as far as I know not a single heterosexual marriage has been endangered in any way. I did once see a gay man from California claim on television that he and his partner were threatening the straight marriages on his street, because ever since they moved onto the block, the wives had been criticizing their husbands for not keeping their houses in as good repair as the gay couple! But that’s the only adverse effect I ever heard of. In yet another segment of The Newsroom, the economics reporter has a running battle with the producer over air time. The economics reporter wants to report on Congress’ unwillingness to raise the US government’s debt ceiling which, if you can remember back to 2011, threatened another collapse of the US economy. According to my economist husband, if the US had not raised its debt ceiling it would have had to default on its bonds. This would have increased future investor uncertainty, because of the added risk that it would default in the future: to counter that, the US would have had to offer higher interest on its future bonds. Meantime, the producer is forced to devote time to a case of a cute little (white) two-year-old girl allegedly murdered by her mother. Finally, a character comes on the TV and recites statistics on the extent of child disappearances and murders, and points out that equally horrific murders of black children go un-noticed by the media. All these episodes are intelligently written, serious looks at what is wrong with US politics and mass media. I could do without the hysterical outbursts by the female lead, as if women executives can’t always be businesslike, but must occasionally revert to their “innate” emotional characters. 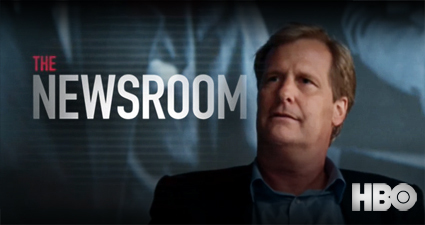 Otherwise, The Newsroom is great television. Reference: “Battle of the Sexes,” Economist, September 15, 2012, p. 25.